I grew up in White Planes - Valhalla, NY. As I child I got sick quite often and would spend time drawing to occupy my time. That is when I first got interested in art. Later we moved to Potomac, MD where I attended High School and was near enough to spend many summers in Ocean City, MD and Bethany Beach DE. I fell in love with the Eastern Seashore. I eventually ended up in Selbyville, DE, after retiring from my career teaching studio art and art education at the University of Kentucky, and it is here that I started writing illustrated and photographic books about the area. While teaching at the University of Kentucky, I published textbooks on environmental design and field guide painting of fish and reptiles. My recent publication, FLYING OVER DELMARVA: Spray Planes, Banner Planes & Bi-Planes, for aviation enthusiasts, was my first hardbound book. The companion books, THE ABCs OF FLYING OVER DELMARVA and FLYING OVER DELMARVA A-Z: PEOPLE, PLACES AND PLANES, AN ACTIVITY BOOK, are activity books aimed for young readers who may one day become aviation enthusiasts, or at least better readers. As an elementary student in New York during the 50s, I was a reluctant reader. Visual art helped me, and I used this memory to teach my university art education students and school teachers. I developed a love of flying while teaching and traveling, but could never justify the expense of flight training or airplane ownership. I greatly admire those who do, and you will see this deeply felt admiration in my drawings. "I love flying. My partner, Rob, has his pilot's license and we fly whenever we can, especially over the beautiful and inspirational Eastern Shore. Living in Selbyville, DE is like going back in time to when life seemed to move a little slower, and we appreciated what we had and had the time to take in nature's beauty around us." 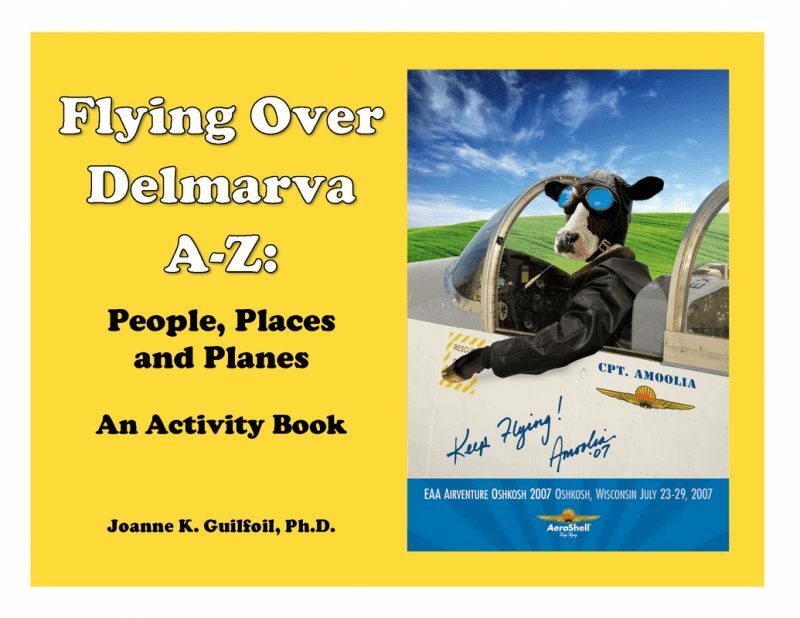 Flying Over Delmarva A-Z is an activity book for school-age children or anyone! It contains 130 drawings to color of people, planes, birds, insects, fish and hangar pets –dogs and a cat– all from the hardbound book, FLYING OVER DELMARVA: Spray Planes, Banner Planes & Bi-Planes.